Happy Tuesday, Girls!! A couple weeks ago I shared some of my favorite girl nurseries and today we're focusing on the little gentlemen in our lives. If you missed the girl nursery post, you can check it out here. I saw in a Pottery Barn magazine varsity letters in the child's initials framed. I loved the look! I found some on varsity letters on ebay. This was from his bedroom entrance. Chambray mixed in with some navy/white gingham for the bedding. I found these cute football canvases online and Marla recreated them for me! I LOVED them! A close-up of the canvas. Didn't she do a good job?? I'm a big fan of those antlers, the pillows, and the color scheme. I love it all!! 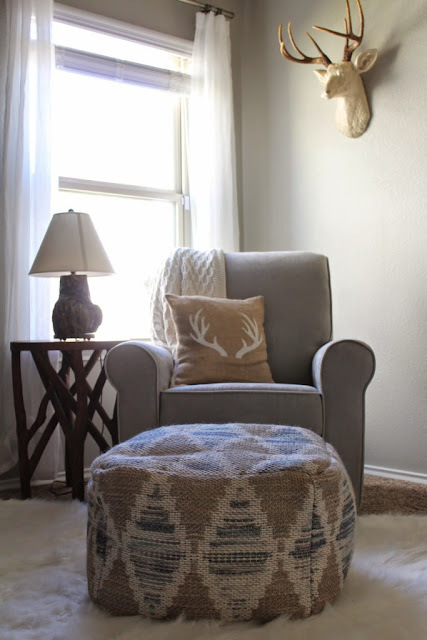 Look how cute that chair, pillow, ottoman are! 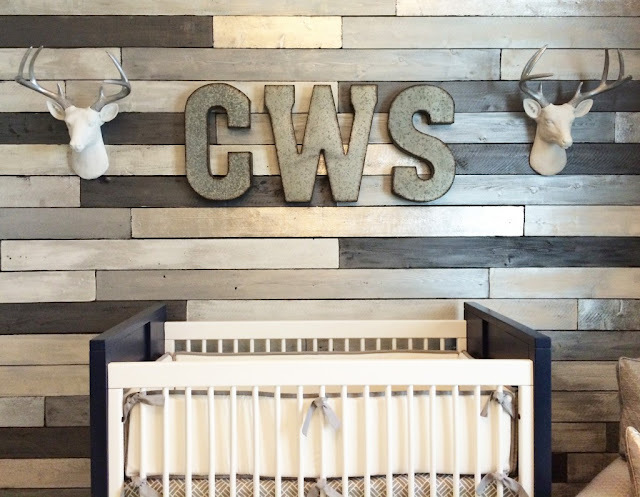 This nursery has the coolest metallic wood wall. I am a huge fan of this crib, the initials, the deer heads. So cute! This nursery has lots of color and I'm a huge fan! I like the navy, green, and orange with all the patterns mixed in. If neutral colors aren't the thing for you then this might be your nursery. A couple of readers asked about neutral nurseries, my plan is to share my favorites on June 23rd. 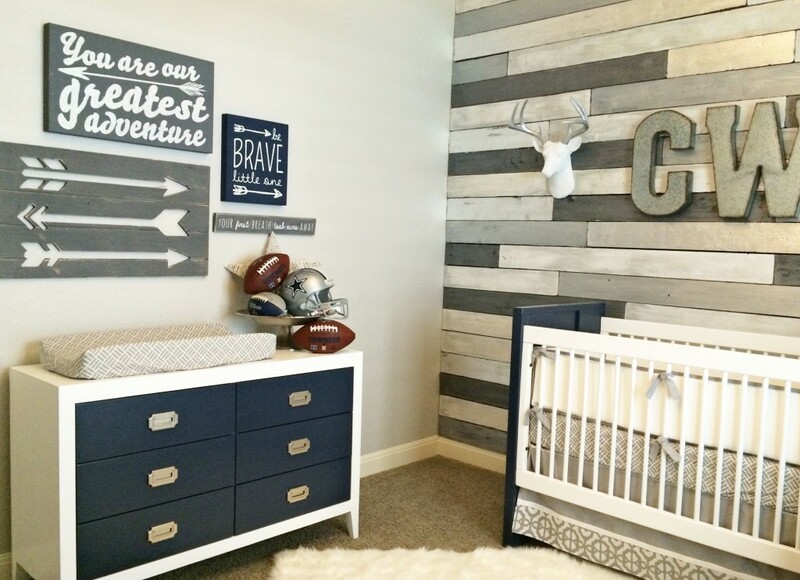 Maybe you're not finding out the gender or just prefer an all neutral nursery? Then the 23rd will be the day for you! Now it's your turn! What did your little guy's nursery look like OR if you were decorating a little boy's nursery today, what look would you choose? Not that I have kids butttt I think for a boy's nursery I would do a travel nursery. Lots of neutral colors, vintage maps, cool pictures etc. That way I could have the basics in neutral colors to use again but accessorize with hints of "boy"
I love these posts! Have a great day! 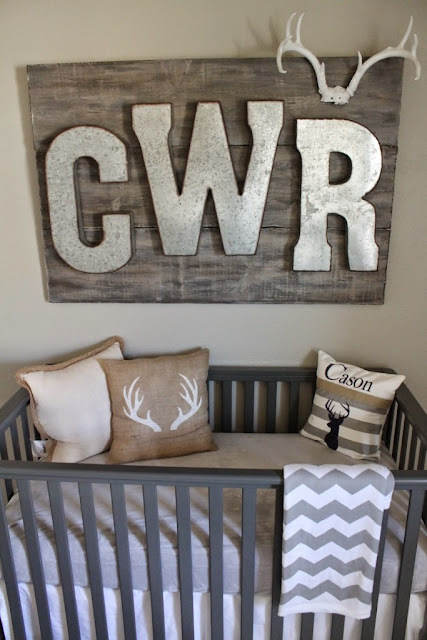 The baby name and nursery posts make me want to have another baby! I loved Nixon's nursery! You had it looking so good when that sweet boy came home :). I love your hunting/fishing looks now too! I love them all! The hunting & fishing and great adventure are my favorites. Love that wall! :) Such a fun post! I love the metallic wood wall! Don't know how I would incorporate it into my house but I love the look of it. Loved the varsity letters. I'm probably too big of a fan of initials and names. Grady's name or initials are on every wall! I don't know how to post pictures on here, but his room is grey, red, and white!